This short extract is from The Centenary of Durham Senior Cricket by Ray Pallister. Published 2002. Just google his article; you will read some interesting notes about past times as well as cricket. This year marked the start of competitive cricket in the North East. The County Cricket Club convened a meeting on November 28th 1887 to launch the Durham County Challenge Cup Competition. This began in season 1888, initially with two divisions (North and South): clubs involved were Barnard Castle, Bishop Auckland, Consett, Coundon, Crook, Darlington, Durham City, Hendon, Hetton Lyons, Jarrow, Medomsley, Norton, North Durham, Philadelphia, Ryhope, Sedgefield, Shildon, Stockton, Sunderland, Ushaw Moor, West Hartlepool and Whitburn. The competition was aimed at encouraging cricket in the county, but it led to endless disputes and protests. The differences in the strength of the club sides led to some farcical games, and meetings of the committee organising the competition were held every week and sometimes twice a week in order to resolve the many disputes. Travel itself was a large problem, despite the network of railways. To get to Coundon or Consett from Norton or South Shields could, in those times, require a day’s journey. Searching for ancestors is a very popular past time these days and there are well known sites that can greatly assist the searcher; an example is the Durham Light Infantry records. Now having said that why not do a free five minute search? 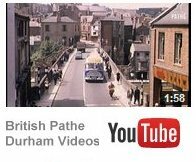 By googling – Ushaw Moor Durham Light Infantry – up comes lots of material on the world wide web. We quickly find that WW2 corporal Fred Cann of the Royal Engineers, a son of Henry and Violet, is buried in Ushaw Moor cemetery; guardsman George Holliday, son of John and Margaret, is also mentioned, as well as private William Morgan, John Hardman and lots more. I knew that Ushaw Moor had impressive success in the Durham County Cricket League during much of the period 1965 to 1973 but the extent of it surprised me. According to Wiki they were champions of that league in 1965, 67, 68, 69, 70, 71 and 73! Great stuff. But it makes you think: was it the case that there was a clutch of local born talented players, several professionals or a mixture of both? Someone told me that a very long time ago the club had eleven professionals, but that is just gossip and therefore not reliable information. What I do know is that there is nothing extra special about Manchester [maybe a very good orchestra] but there are two football clubs there that attract world class players; it is reasonable to assume that money brings them to Manchester, as well as trophy seeking, but is it reasonable to link paragraph two with this one? After all football is not cricket. Poet Dora Greenwell was a friend of Christina Rossetti and for a time lived at Greenwell Ford, Lanchester. Some of my family served the Greenwell family at that address. Anyway we are told by several weather forecasters that we can expect a harsh winter – so get that poem off pat and stay in bed. With your wife or husband or partner. If you have one. A CHILDHOOD love of steam engines has inspired artist Steven Fox’s railway art. His mixed-media work includes portraits of volunteers who work to keep the heritage railway lines open and intricate portrayals of steam engines and trains. “Railways were part of my childhood,” explains Steven, from Esh Winning, near Durham City. “My dad was also interested in steam engines and he took me to Newcastle station to mark the 150th anniversary of the opening of the Newcastle to Hexham line with the engine The Evening Star in March 1985. From today, Steven, who studied arboriculture at Houghall College in Durham, will be displaying his original Heritage Railway art titled Hot Coals & Ash for the first time in his hometown. The exhibition, which opens to the public tomorrow, will be in the Durham Room at Durham County Hall and opened by the chairman of Durham County Council Dennis Morgan. Among the special guests at the preview evening will be Richie McCardle, from Consett, who is an engine driver on both the Weardale Railway and the Keighley & Worth Valley Railway. He is one of the subjects in Steven’s work. The 41-year-old lives close to Ragpath Wood, in Durham, a Woodland Trust site of ancient woods left over from the last ice age mixed with relics of the mining industry. He is inspired by its natural history landscape – the walkway there follows the old branch line from Waterhouses to Durham City Railway Station. This was a major transport link for the mining communities living and working in Deerness Valley and an oil painting of this walkway is shown in the exhibition. Artist Steven Fox’s love of steam trains is not hot air – Arts – Culture – JournalLive. Someone commented recently that the Harwood collection of photographs was not particularly exciting, or words to that effect. I can understand that point of view but cannot agree with it. Some of the London and Durham photographs were very good and there is something to be got from the Deerness Valley pictures as well. My favourite is one that looks over the valley. It’s 1935 and one just knows that a fifteen minute walk to the east will bring me to an eleven year old mum and a set of grandparents in their early thirties pomp. Hitler is scheming and plotting at this time and the Battle Of Britain is five years away. The explosion at Ushaw Moor pit in 1932 was still fresh in the local memory as were Arthur Gill and William Timmons, the lads that perished in that tragic accident. But there were other pit fatalities around this time and that applies to New Brancepeth colliery as well. The picture looks very familiar; it is as if little has changed since the time it was taken apart from alterations brought about by pit closures. People worried about the cost of living and whether so and so was having an affair. I have noticed that in some villages the place looks the same for decades and then… massive, or at least significant, change takes place and that has happened recently in Ushaw Moor. South Moor of the 60s looked totally familiar in 2010. And by the way the sun shone then and the sky was frequently blue. No one walked at a funny fast pace in black clothes whether it be 1900, 1935, 1968 or 2011! Back in the 1955/56 football season my stepfather took me to see Derby County take on Gateshead. All I recall is that Derby played good football and the Gateshead players were enthusiastic triers. Tommy Powell the Derby right winger made a fool of the opposition’s full back and even the Gateshead fans saw the amusing side of it and laughed. Those were the days of the maximum wage and consequently players with First Division [Premier] ability did not always see any financial advantage in moving; consequently some of them tended to be ‘loyal’ to their lower league club. That applied to Tommy Powell one of the best wingers never to play for England. For the record – Gateshead 2 Derby County 4, weather fine with a slight breeze. A breeze for Tommy that is for sure. I was hooked in 1955 and have been a brain dead besotted Rams fan ever since. It is true that I have seen them play at Newcastle, Spurs, Derby, Tottenham, QPR, Middlesborough, Darlington, Crook and a few other grounds but think of the money saved overall. I saved 20,000 smackers by not getting regularly involved with the likes of Sunderland and Newcastle; season tickets, hamburgers, coffee, pies, beer and bus tickets were seldom required as Derby was far too far away from Ushaw Moor for me to contemplate regular trips and the expenditure involved. Thank you step-father. Money well saved. I smoked from the age of 21 to 27 and stopped. Just contemplate the amount of cash saved by making that decision. Not that the obnoxious cigarette manufacturers worry about my spending patterns. No. They are in China trying to tell a Chinese person how silly I was to stop. I guess. So forty grand. Maybe more. All spent. Children are expensive are they not? The last post on this memories site, by someone other than myself, was quite some time ago and that makes me want to ‘help’. Sometimes a problem then arises: my ‘helpful scribble’ has little or nothing to do with your desired memories. Take the radial washing drier on our patio; I am convinced that it is a female radial because only flattery [or is it love?] gets it fully erected. I have to tell it that it has beautiful blue lines for holding the washing and furthermore that I will never ever replace her with something big and brassy. Whatever happened to Eric Clegg? He played a few games at inside left for our Ushaw Moor County side and I can remember sliding a pass through for him to run onto in 1958. He did not have long to wait because it was 1958 at the time. He duly smashed the ball past the hapless Sherburn goalkeeper. Or did you place it Eric? Come in Eric and describe your glory goal. I have decided that if Madonna can continually reinvent herself then so can I. Consequently I have far too much to do down here, what with getting a move on with cooking, getting physically fit, and being a joy to live with. That’s enough for most men and certainly I will have to spend much less time with my radial clothes line. It all means that I cannot get up north this year and that leaves a few loose ends. I need to post Brian’s glittering prizes to him but I am without his address or phone number. It is not always wise to release such information onto the net; perhaps I can get his prizes to him at the working Men’s club where I believe he works. Brian’s prizes will hopefully bring him some pleasurable reading. There are almost fifty photographs of the Durham City area in the book by Ian Nelson; one of my favourites is the one of North Road taken in 1914, although there are several much earlier photographs. The other book , written by Norman Emery, is also a very good read and runs to two hundred and ten pages.